A tiny pamphlet is thrust into my hand by the street preacher’s confederate. Searching For Answers? it says, the question mark meaning, I suppose, ‘are you searching for answers?’, to which the answer is probably ‘no’. I’m not even sure I know the questions, which rules out, I can’t help feeling, finding the answers. It is badly printed and has a picture of a sunset on the front; inside shoddy grammar and misspelling tell me, not entirely to my surprise, that I need God. The preacher is in full flow. Evolution, he’s saying, is a hoax, though he doesn’t tell those passing by why it is. Unless we repent of our sins and accept Christ, he insists, we’re all going to Hell and waves his Bible to prove it. A woman sitting on one of the nearby benches shouts something back at him – I can’t quite hear what, though it’s something about love – and he, with the advantage of his microphone and loudspeaker, bellows at her that there’s no arguing with God’s Word. Plus, he’s only telling her what a terrible person she is because he loves her. I’ve made the mistake of slowing down to hear what’s going on and as I attempt now to walk on, to return to the reality of Saturday afternoon shopping, the man with the tracts catches me again. ‘There’s nothing better than turning to Jesus. And he likes nothing better than saving another lost sheep. Are you a lost sheep?’ he adds. ‘Ah, but do you have a home in heaven?’ he asks. He’s good; whatever I say, however light I try to make it, he turns it round into another impertinent question. 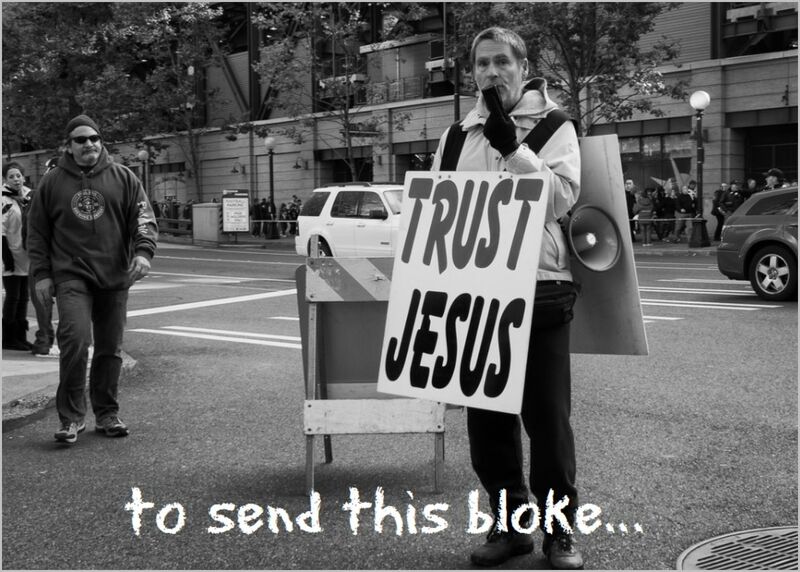 ‘Jesus!’ I mutter under my breath. ‘Look, I don’t believe in your Christ or any of this stuff.” I push his tract back at him, ‘and I’m not your friend either.’ He looks crestfallen, but only for the briefest of seconds. His ally, still performing for the crowd, is shouting that Jesus is coming back soon to judge the world. ‘And you’d better be ready,’ my new best pal tells me, reinvigorated. I shake my head and step round him, apologising that I have to go; why? I wonder, when it was he who accosted me? So, despite not searching for any answers, I now have them. They just don’t seem to match any questions I might have, like why there’s so much suffering in the world and why human beings do such terrible things to each other (often in the name of religion) and what am I going to have for my tea? Now there’s a question worth answering. A programme on the UK’s Channel 5 this week, Trapped In A Cult?, featured stories of people who had had encounters with or had escaped from cults. It didn’t spend too much time defining what a cult might be, but suggested that it’s a movement revolving around a charismatic individual who insists that only he or she has a direct line to God or some sort of Higher Truth. Such individuals insist that others must follow their teaching exclusively and that followers sever all ties with family and non-believing friends. They frequently demand too that followers give up their material possessions in order to demonstrate their commitment to the movement. and John 14.23: Anyone who loves me will obey my teaching. My Father will love them, and we will come to them and make our home with them. and Matthew 12.30: Whoever is not with me is against me, and whoever does not gather with me scatters. For example in Luke 14.26: If anyone comes to me and does not hate his own father and mother and wife and children and brothers and sisters, yes, and even his own life, he cannot be my disciple. He told those interested in joining his movement to give up material possessions: Matthew 19.21: If you want to be perfect, go, sell your possessions and give to the poor, and you will have treasure in heaven. Then come, follow me. and when he died, his followers persuaded themselves he’d gone on to a higher plane: Luke 24.51: While he blessed them, he parted from them and was carried up into heaven. What do we learn from this? That if it looks like a cult, sounds like a cult and behaves like a cult then the chances are, it’s a cult. 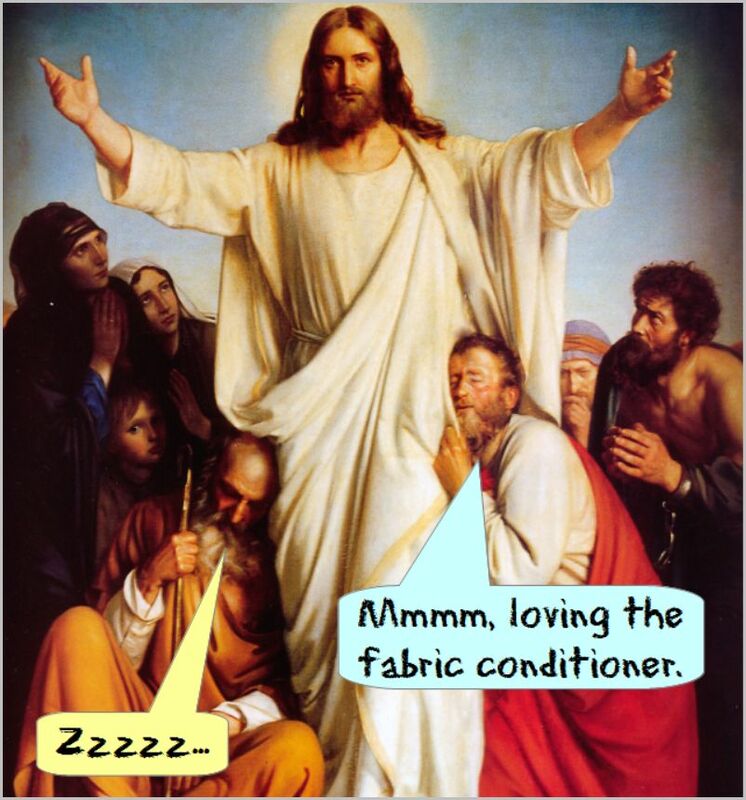 Christianity is just a first century cult that hit the big time. We are now so used to having it around – how legit it became! – we overlook its origins and essential characteristics. These are exactly the same as any other cult, both before and since. ‘When you think about it’, the taller of the two men said, ‘there is no evidence whatsoever that God, nor indeed any supernatural being. ‘I suppose you’re right’, said the other. ‘With that realisation, my faith began to dissipate. I mean if there’s no God, no angels, demons or Christs, no Holy Spirit, devils, fairies or Santa Claus, then it must mean they’re just figments of the imagination. Take that human element out of the equation and what you’re left with is… well, the natural world and nothing else’. ‘I suppose not’, said the other. ‘From there one realises there is no point in praying – I mean, talking to a being who only exists in your own head. Or reading the Bible; one begins to see it as a very human book, which of course it is’. ‘I suppose so’, said the other. ‘It means too that Jesus can only have been a mortal man – of course he was – and that a good deal of his teaching – if we can believe it really was his and not simply invented by his followers – makes no sense whatever. It was only the eyes of misplaced faith that made it appear so’. ‘I suppose it doesn’t’, said the other. ‘I mean, “pray for whatever you need and God will supply it”. Who has ever believed that sort of thing anyway? No-one. Not really. We all know that doesn’t work; Jesus himself, one suspects. And as for the resurrection, well, if you read those accounts at face value all they saw – Mary Magdalene, Paul and the rest of them – all they saw were visions, not a real person. All in their minds, you see’. ‘I suppose I do’, said the other. ‘No, Christianity is nothing but false promises, failed prophecies – Jesus saying he’d return within his disciples’ lifetime – and impossible morality: “be perfect as your father in heaven is perfect”! Well, I’ve never met anyone who is, Christian or otherwise. Good people are good whether or not they’re Christians and the mean-spirited are mean-spirited whichever side of conversion they’re on. It’s a miracle! 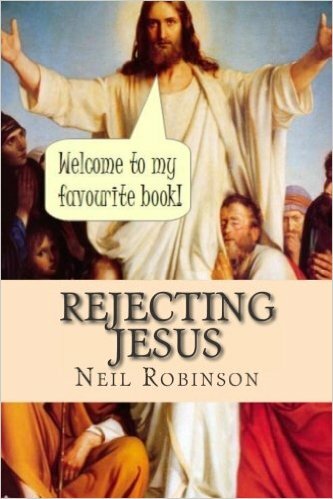 Rejecting Jesus is now in book form! And on Kindle too. 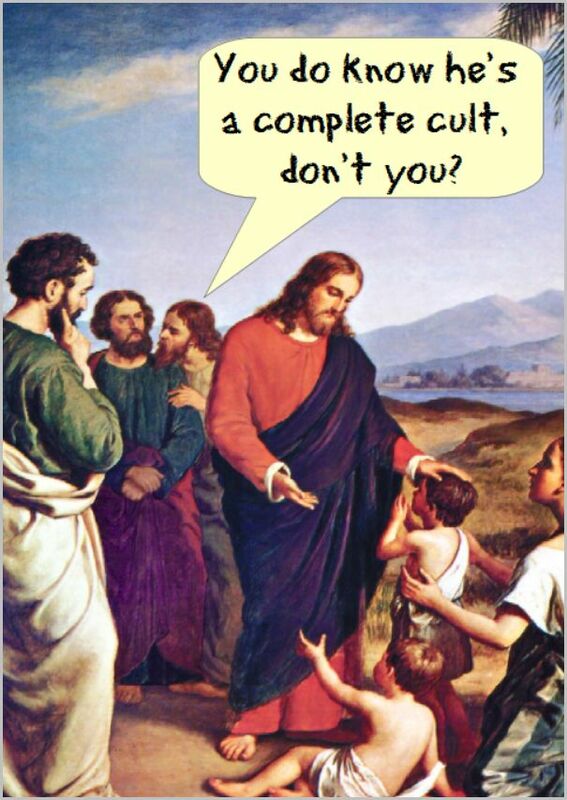 Well, not quite – sorry JC. 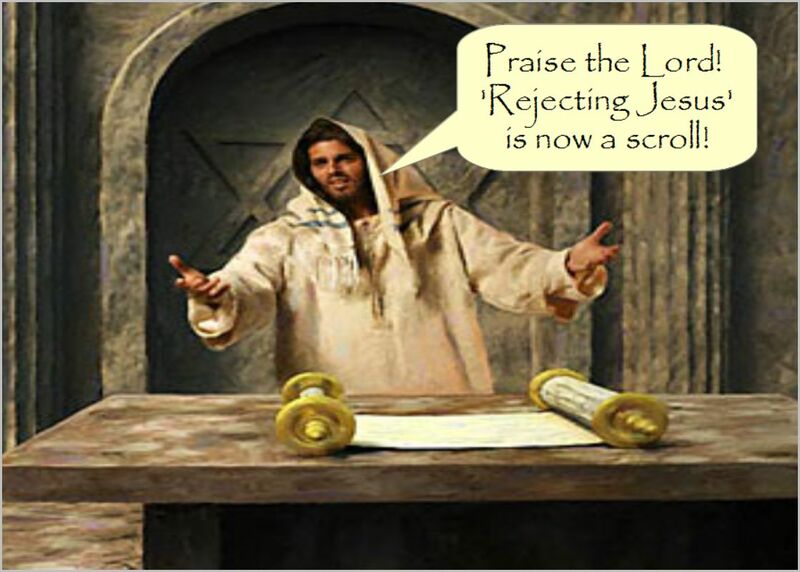 But you can now read Rejecting Jesus posts in the format the Son of God would surely have preferred if books had existed then the way they do now. The pictures are all present and correct too, in glorious B&W, for all first-century messiahs to enjoy. Available here and here and also all over the world. Go, buy it, make disciples of all nations. Meet Father Dwight Longenecker. He operates a blog called Standing On My Head, which, if he really does, might account for the topsy-turvy view of the world you’ll find there. 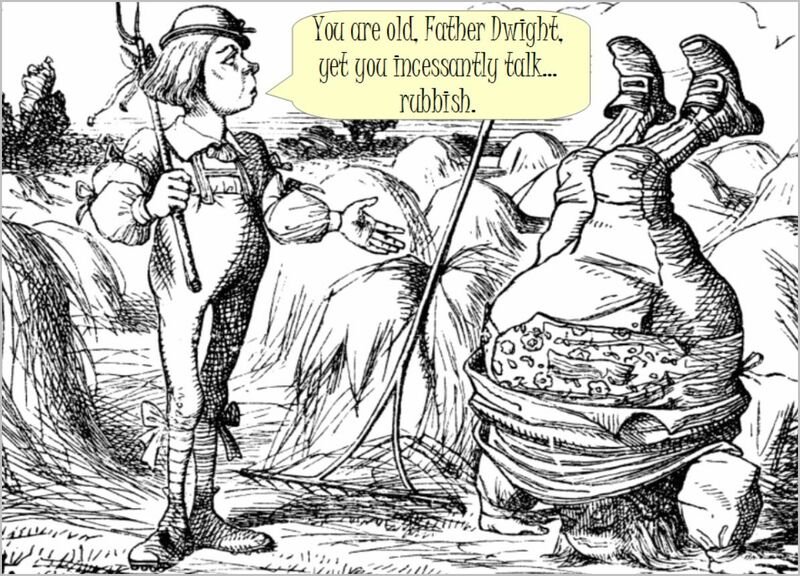 Dwight makes grandiose and daft claims for the Roman Catholic church while taking side-swipes at others’ beliefs: Atheism, he says, is dull because – quite unreasonably – it insists on ‘evidence’, which Dwight is sure is quite over-rated. Other belief systems are boring because they don’t involve nearly as much dressing up and parading with statues as Catholicism. Islam is a demonically inspired religion that can only be defeated by Aslan the Catholic church’s special magic… you get the picture. There is only one God who is the source and ground of existence. However, there are also demonic beings sometimes called “demi-gods” that many people worship as “gods”. The ‘everybody is wrong but me’ argument, which is ironic when so much of what Catholics believe isn’t even remotely biblical: the Pope, purgatory, Marian worship, saintly intercession, transubstantiation. All this extraneous stuff is regarded by other Christians as being itself ‘demonic’. Dwight doesn’t seem to realise he’s in a glass house (church?) and in no position to cast this particular stone. I would have thought the universal human belief in an afterlife – as well as near death experiences – provide ample evidence, but of course (atheists) dispute that. The problem here is that there is no ‘universal belief in an afterlife’. As I note in ‘All Is Vanity’ below, the belief in the resurrection of the dead is a very late development even in the Old Testament; ancient Judaism, despite its belief in Yahweh, did not consider the possibility for most of its existence. That said, if there were such a universal belief, it would not mean eternal life actually existed. There has always been widespread belief in fairies and sprites but that doesn’t make such beings real. There is no correspondence between the extent and persistence of a belief and the existence in reality of its object. As for near death experiences, the clue is in the name; near death. Near death is not death, it’s life. How else would we know of the experiences if not through people who have been resuscitated, brought fully back to consciousness? These experiences are now known to be brain-induced hallucinations while a person remains, if only just, alive. Your understanding of the Catholic approach to the afterlife is immature. We don’t spend our life trying hard to get into heaven. We spend our life in an abundant, joyful and disciplined way being a follower of Jesus Christ and aiming to become “perfect as he is perfect”. That my understanding of an immature belief is immature seems fitting. I don’t suggest Catholics spend their lives trying to get into heaven; this is a straw man of Longenecker’s creation. I’ve also yet to meet a Catholic who is any more ‘perfect’ than the rest of us. I’ve not encountered many joyful ones either, come to that. The intrinsic problem with your saying you would rather make the “most of this life” is the question of what that actually means. Your idea of “making the most of life” and your neighbor’s idea of “making the most of life” could vary enormously. Who is to say what “making the most of life” consists of? Dwight and the church he represents would rather we all conform to Catholic ideas of what makes life worth living. As for who is to say what making the most of life consists of, I’d have thought it was those living it. Dwight has chosen strange religious practices as his way of living his life, but so insecure is he in his choice he feels the need to denigrate others’ choices as a means of bolstering his own. It seems to me that most of the problems in the world are caused by people “making the most of life”- which usually means unfettered and total selfishness – which of course leads to destruction. I’d be the last person to mention the Catholic church’s paedophilia scandals, its covering up of those scandals, its suppression of women and LGBT people, its accumulation of vast wealth in the service of one who constantly preached against it. Nor would I want to say anything about the church’s historic failings (so no mention of the Inquisition, the imprisonment and execution of those who disagreed with it, its support of Hitler and so on. Dwight presents no evidence for his subjective claim (‘it seems to me’) that the only alternative to Catholicism is hedonism and selfishness. The false dichotomy is wholly disingenuous. It is not hedonism or atheism that says we merit God’s special attention; not atheism that panders to our selfish desire to live forever; not atheism that says God will get us out of the hole into which we’ve dug ourselves; not atheism that promulgates such a supremely arrogant and self-centred view of life. No, it’s the Christian perspective that does that, the Catholic one. Indeed, it could and has been argued, by Hitchens, Harris et al, that most of the problems in the world are caused not by atheism or even ‘unfettered selfishness’, but by religion. Atheism and the humanism to which it gives rise accept that we got ourselves into this mess and it’s ourselves who will have to get us out of it. Maybe that’s boring and maybe it will prove impossible, but it’s better, more realistic, than appealing to fairy tales, dressing up and talking to statues. High on this feeling some believers started imagining they were actually in the dead leader’s presence and – miracle of miracles – could see him and commune with him (1 Corinthians 15.5-8). Such an experience, they felt, could only be from God and must, in some inexplicable way, actually be a part of God (1 Corinthians 2.10). And so the Holy Spirit – the capital letter version – was born. Spiritual highs had taken on independent existence as an aspect of God. Except, of course, they didn’t. They remained feelings, amplified in and by a communal setting. And that’s what they are today. Which is how, when a Christian tells you the Holy Spirit prompts him or her to say or do certain things, the result is always in line with the teaching of his or her particular church or sect. So, for example, the interpretation of the scriptures to which the Holy Spirit leads a group of believers is fully in keeping with that of their denomination, church and pastor. Dissent is actively discouraged and those with different views are apostate, deceived by the devil and not led by the Spirit at all. Maybe, they’re told, they were never really Christians in the first place, which is remarkable, when the dissenters’ experience of the Spirit is every bit as real as the rest of the community’s. Experiencing one’s own thoughts and feelings usually is. It never seems to occur to Christians how odd it is that this supposed aspect of God, the Spirit, leads different groups of believers down different, often contradictory, paths. How could it do that if it was truly of God? Why would it do that? It’s erratic, idiosyncratic methods are clear evidence of the human origin of its ‘working’. The Holy Spirit’s prompting is, as it was in the beginning, a communal feeling given ’embodiment’ by corporate consent. It even works effectively when believers are separated from each other, social pressure producing conformity. Experiencing the Holy Spirit is not unlike the way those involved in a séance or in a ‘haunted’ house convince each other there is a presence in the room. These ‘ghosts’ are socially constructed too, from shared feelings and often not a little ‘guidance’ from those who claim to know better. The Holy Spirit is ‘realised’ in the same way, most clearly among a ‘worshipful’ group of Christians whipped up into a state of euphoria attributed to the work of the Spirit. But the Holy Spirit is without independent existence in both origin and manifestation. 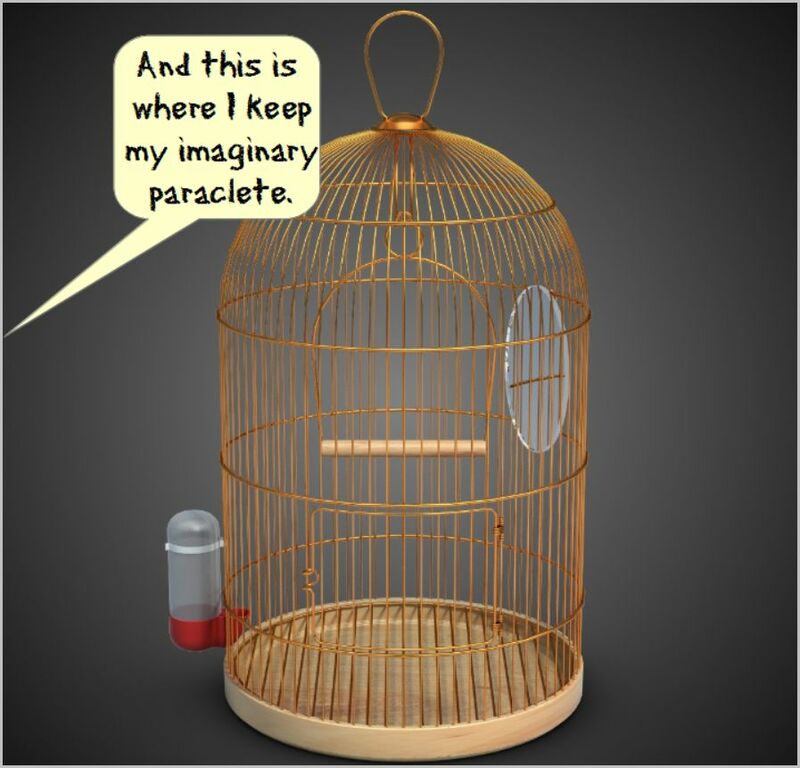 It is human make-believe through and through. Any Christians who think otherwise are invited to provide evidence of the Spirit’s independent existence, separate from human emotions and imagination.